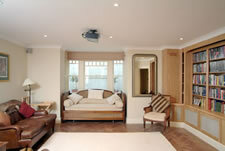 Mr. & Mrs. C are both legal professionals and have a home in South West London. With a new family on the way they needed additional space and employed Room Below to create it. Room Below were responsible for obtaining Planning Permission, Building Regulation Approval, Party Wall Consent and design of the sub-structure. Construction of the sub-structure comprised formation of a retro-fit basement, installation of an underground sewerage mini-pumping station, waterproof envelope and replication of the front bay at basement level. Fitting out works were subject to a separate contract carried out by Simon Brummitt.